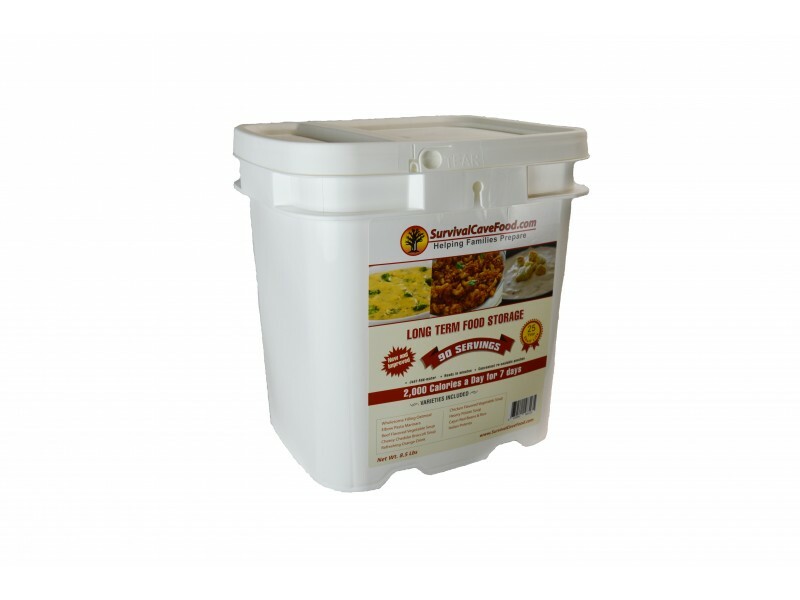 This 90 serving’s bucket from Survival Cave Foods are perfect for emergency food storage. The easy to carry buckets are perfect for storing, or grabbing and taking with you if you need to evacuate quickly. It allows you to access the dried food pouches which only take minutes to prepare and enjoy. With enough food to last a family for several days, or an individual for over a week. The 90 serving’s meal bucket can provide an adult with over 1000 calories daily for 15 days or, alternatively, 2000 calories daily for 7 days. The freeze dried meal is packaged in such a way that it can remain fresh for 20 years. The re-sealable zip lock incorporated into this bucket is very convenient; allowing you to take out only what you need, and keeping all remaining food safe and secure. 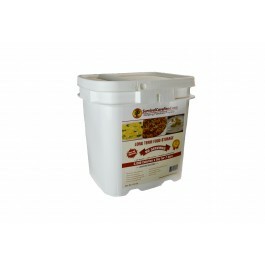 As food prices continue to sky rocket, the freeze dried food bucket is an essential product to have in your home. It is ideal for emergency food storage and saves a lot of time and money. Included in this 90 serving emergency bucket is 1 pouch of wholesome oatmeal, 1 pouch fluffy scrambled eggs, 1 pouch beef flavoured vegetable soup, 1 pouch cheesy cheddar broccoli soup, 1 pouch orange drink, 1 pouch chicken flavoured soup, 1 pouch hearty potato soup, 1 pouch Cajun red beans and rice and 1 pouch Italian polenta. Each pouch contains ten servings, making this an excellent option for families to survive on during emergency situations. All of the food contained in this 90 serving bucket was specially chosen not just for long shelf life, but also to provide a wide range of different vitamins, minerals and other nutrients, which are essential for survival in emergency situations. This light weight packaged freeze dried food comes in and easily storable bucket and provides 2000 calories per day for 7 days or 1000 calories per day for 15 days. Each freeze dried meal is packaged to stay fresh for 20 years. Each pouch of freeze dried emergency food has a re-sealable zip lock that allows you to use the number of portions you need, reseal the pouch and save the rest for later! Survival Cave Food satisfies all of your food storage needs with an economical, delicious and cost effective freeze dried food and a way to prepare you.